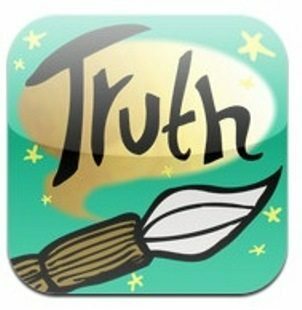 “Brush of Truth” from Story Bayou is an interactive story designed for readers from ages 8-12. The user can explore an interactive story and make decisions at critical points to control the outcome, leading to one of twenty different endings. The app is likely to provide several hours of novel play for users, and the story is engaging enough that many children will want to repeat sections they’ve already completed. Brush of Truth lets the reader control the story in this amazing interactive story for 8 – 12 year olds. Highly recommended! This application is well thought out and of high quality. The home screen is clear and simple, making it readily accessible for most children. Instructions to use the app are written in child-friendly language. The system of marking which paths have been explored is intuitive and easy to use. My one concern for this application is that the reading level seems high for the intended audience. Eight year olds are often in the third grade, and reluctant older readers may well not be reading at the expected grade levels. I assessed a few random pages using the Flesch-Kincaid algorithm, and found one passage at fifth grade level, one at sixth and one at tenth. The words are simple enough for the intended audience, but many sentences are long and complex, which might make the story difficult for younger or struggling readers to comprehend. On the plus side, the makers of the app have included information about corresponding lesson plans, activities, and printable worksheets on their website that are keyed to the Common Core Standards. This will really extend the app’s usefulness in classroom and other school settings. The app could be improved, however, by the addition of the ability to monitor several users’ progress through the story at the same time. Presently, only one user at a time can keep track of which story paths have been visited. The reset system starts the record-keeping functions again, so that if a second child uses the program, the first will lose information about progress. Children are likely to find this activity very engaging and entertaining. The story is in the fantasy genre, but is close enough to reality that it doesn’t take the reader too far from the everyday world. Ordinary events are sprinkled with just enough extraordinary occurrences to keep children’s attention. The characters have a great sense of control of their own lives. The magic paintbrush, capable of bringing drawings to life, is something that many children will relate to because they’ve dreamed of a similar tool at some time in their lives. The “choose-your-own-adventure” format of the e-book immediately engages the reader, and while the genre was popular in printed books a few decades ago, is likely to be a new and intriguing experience for the young audience. This application will provide hours of play value as well as educational value to children from 8 to 12 years of age. At $1.99, it is a good investment. Reading practice is a vital part of school success, and this app offers that practice in such a fun way that many students won’t even notice they are actually working on school skills. With so many decision points and paths through the story, they will be occupied for many sessions. The related resources provided for teachers on the website are an added bonus feature that increases the app’s overall value. This app is child-friendly for the most part. Parents need to be aware that the home page contains two links (ABOUT and NEW STORY BAYOU APPS) that open a web browser to the Story Bayou home page online. Children could access other sites on the internet from these links. However, all links that offer emailed information or purchases from within the app are protected by a pop-up form that requires an email address be entered before accessing the App Store or signing up for the mailing list. These links are embedded in the parents’ sections of the application.